I was taking early morning photos of mushrooms the other day with my little camera. 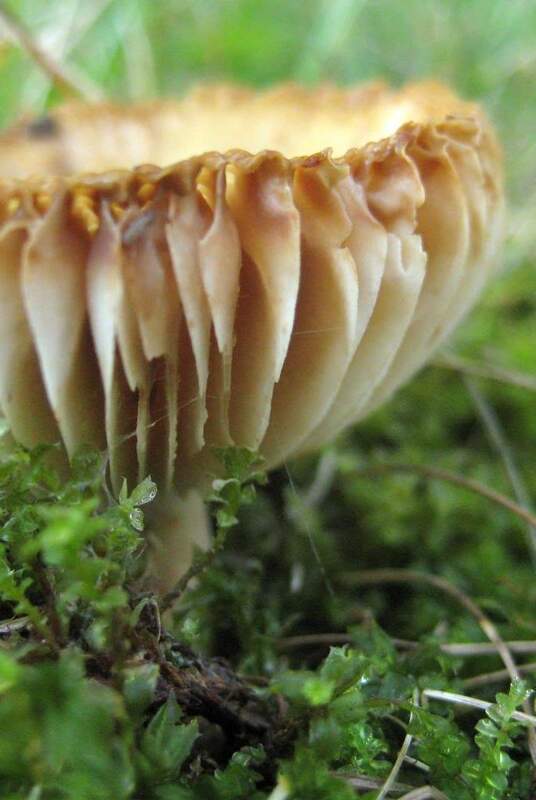 Its tiny size makes it perfect for mushroom photos, because I like to set it to macro mode then get the camera as low as possible to see the mushrooms from underneath. Makes it look like I'm one of the small critters that normally sees mushrooms as the towering "trees" of the jungle that is the lawn. 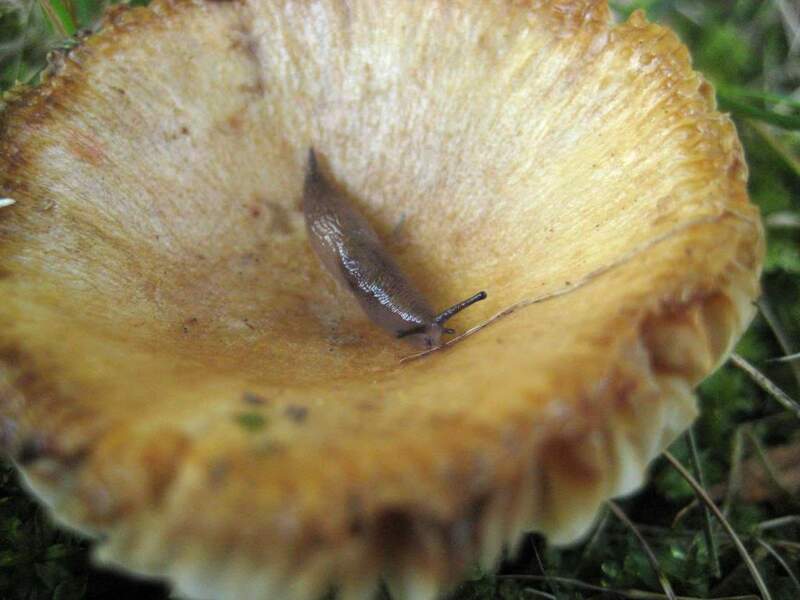 I actually snapped two of those "underneath" photos before I even realized that there actually was one of the small critters here already, hiding in the "bowl" of the mushroom. Many types of mushrooms start out rounded, then they flatten out, and finally curl upward, forming a bowl of sorts. I never really knew why, but now I do: to hold slugs! But sort of a "skatepark" for this slug when seen from above. 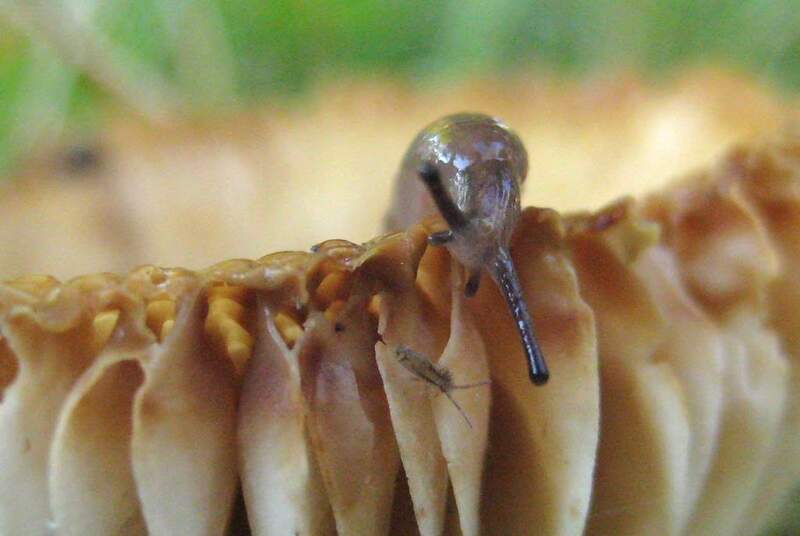 It's saying "hello" to the little bug as it looms over it, in the same way that I am saying "hello" to the slug as I loom over it. Ok, not really interested in the little bug. I'm not sure that it can really even see the bug. The larger tentacles are what it uses to see with, but I don't know how refined the eyes are. I've read that they're sensitive to light but can't sense colors. How much detail can they make out I wonder? It's now sprinting around the edge, relatively speaking. See the hole in the middle of its body? That's the pneumostome, which is a sort of breathing hole. 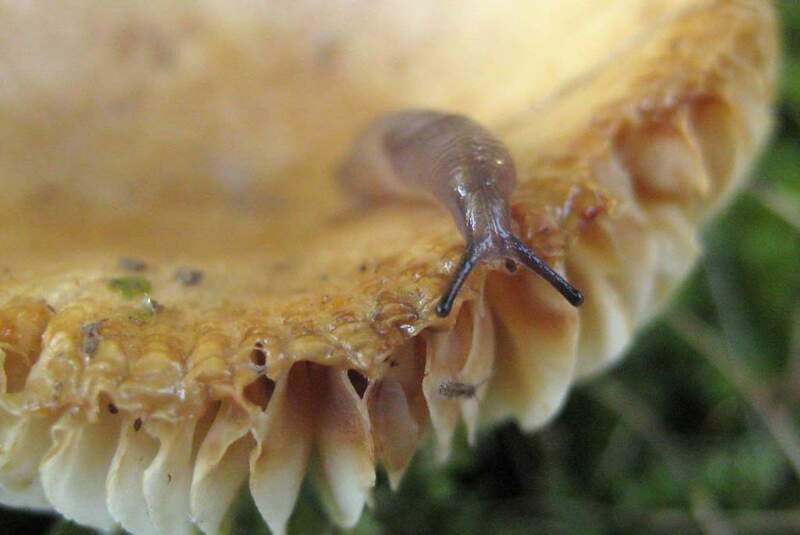 Although the slug absorbs air through its skin, when it's really exerting itself -- like when it's moving -- it draws air through this hole, filling a "lung" inside its body. 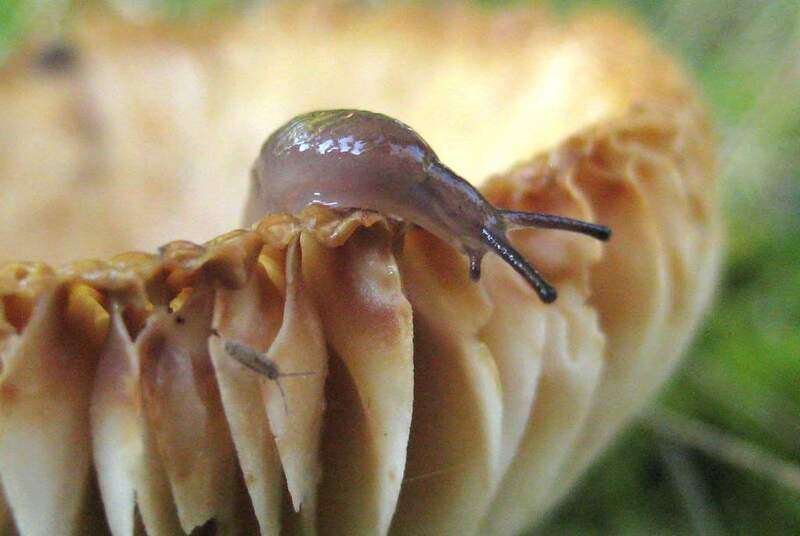 The extra surface area of this "lung" gives the slug extra breathing power when it needs it. 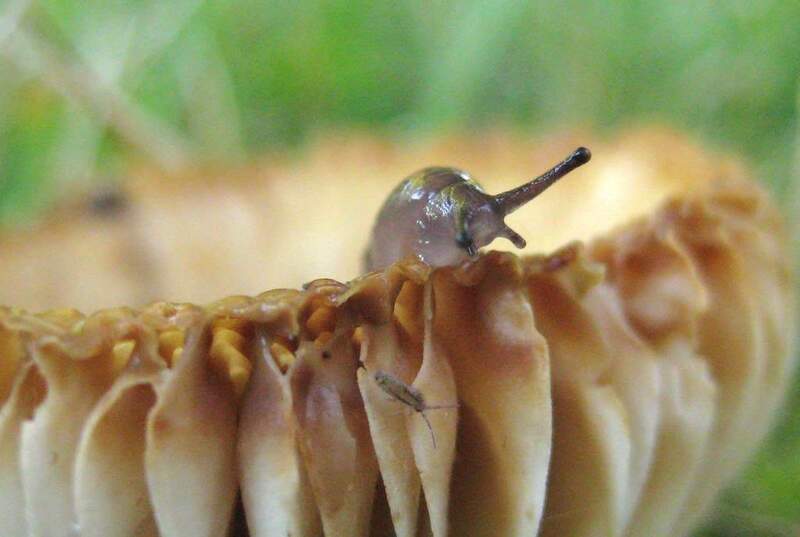 Actually, I'm not sure if the slug is really "sprinting" around the edge of the mushroom at all. It may be nibbling on the edge. 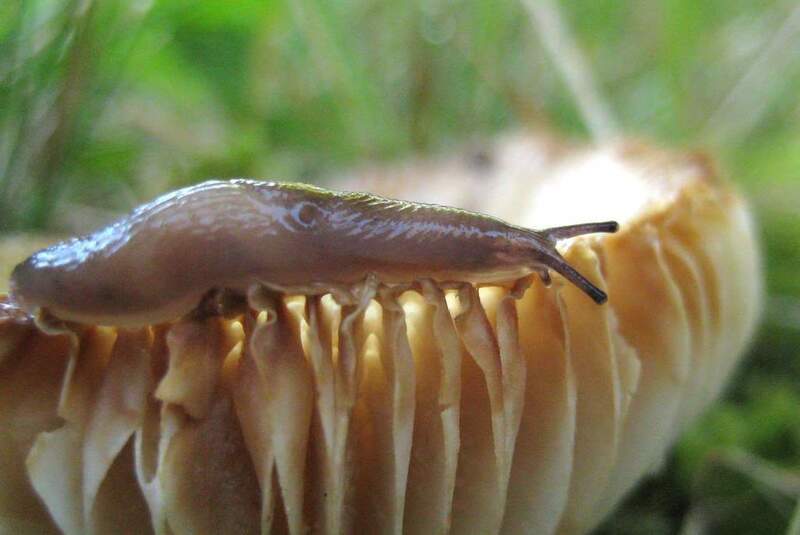 Slugs are omnivores, and will eat fungi (like this mushroom), plants, and carrion (dead bugs) as I've already seen a couple of months ago. I'm glad I was awake enough this morning to actually notice this slug, as I find them to be pretty interesting. When they're not eating my hostas that is.